Well, if all goes according to plan, I have some pretty exciting news to share with all of you in the coming weeks (!!! so stay tuned). 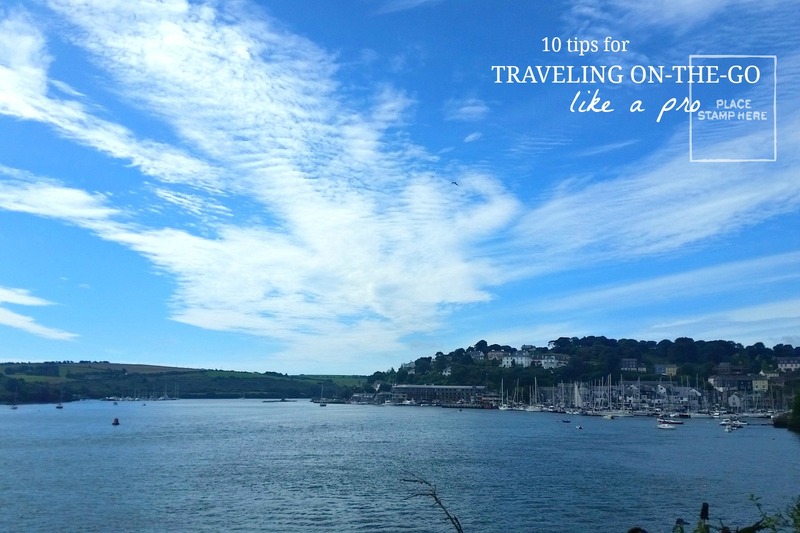 Until then, I’m throwing back to some of the best travel hacks that I learned during my time abroad–if you’re planning a sojourn anytime soon, you’ll want to keep a few of these in your back pocket so you can travel on-the-go like a total pro! 10. Pre-print any documents you might need: directions, contact info, spreadsheets. 9. Contact your mobile provider in advance for international data and texting plans. Before I left for Europe, I contacted my mobile provider and asked them about affordable international data plan options. I ended up purchasing a plan for unlimited international texting and something like 200 MB data for emergencies–thankfully, too, because I ended up using all of it (and then some!). While the price tag was pretty hefty, it felt good to know that I had a fallback in case I needed it. 8. Invest in a sizable external battery pack for your phone. 7. Consider getting TSA Precheck or Global Entry access. Although this doesn’t apply to folks who travel sparingly or are not from the US, one way to cut down on airport time if you’re a frequent American traveler is by investing in either TSA Precheck ($85–expedited line for domestic flights, no need to take off shoes/jackets in security) or Global Entry ($100–all the perks of TSA plus expedited line for US border control). Both passes are good for five years, but I’m glad I decided to shell out the extra 15 bucks because it’s saved me hours of extra wait time already! 6. Pack a collapsible bag inside your suitcase for those “extra things” you’ll end up bringing home. You know that weird phenomenon whereby your suitcase comes home heavier than when you left? In case you’re worried about being able to cram all of those keychains, novelty books, and other knick-knacks into your bag on the way home, just tuck away a collapsible duffel bag. You might have to pay for an extra piece of checked luggage, depending on your airline, but at least you don’t need to fret about leaving behind those Swiss chocolates! 5. Back up and clear your phone’s SD card. 4. Bring a few zippable bags. Extra food? Dirty underwear? Wet shampoo bottles? Just shove all of that into a zippable plastic bag! 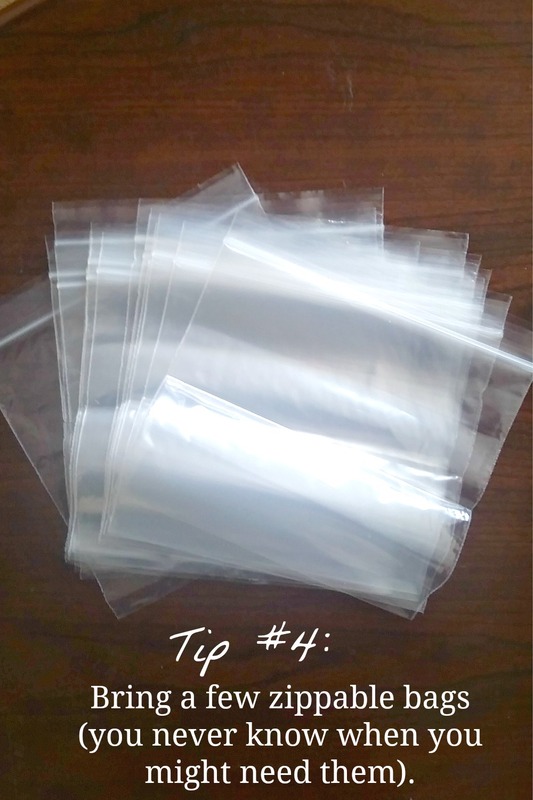 I also recommend an assortment of larger plastic bags for things like shoes and dirty laundry. And don’t forget one or two quart-sized zippables for those in-flight (<3.4 oz.) liquids! 3. Communicate with your travel companions and make sure that everything is in order before you go. There’s nothing worse than finding yourself in an unfamiliar new place and then learning that you don’t have anywhere to stay the next night because of a miscommunication. If you’re traveling with someone, double-check your bases and make sure that you both know your itineraries (including places to stay, check-out details, flight times, travel plans, and anything else that requires prior booking) well before you leave. Trust me, scrambling to make phone calls and hunt for accommodations abroad are the last kind of “on-the-go” frenzies that you want! 2. Also, contact your financial institutions and let them know that you’ll be traveling. 1. …Bring snacks, snacks, SNACKS! Do I even need to convince you guys that having a stash of food with you at all times is an absolute must?? I thought not. Although there was so much food in Europe and Italy that I was nearly bursting out of my jeans by the end of every day, keeping a variety of travel-friendly snacks on hand helped me survive the long airport waits and train rides without wanting to slobber all over a neighboring stranger’s meal. After careful consideration, I decided to bring a few small bags of trail mix and about a dozen bars for maximum snacking potential. I would recommend something with wholesome ingredients and craveable flavors that’s likely to keep you satisfied longer, like Special K’s new Nourish® Bars. 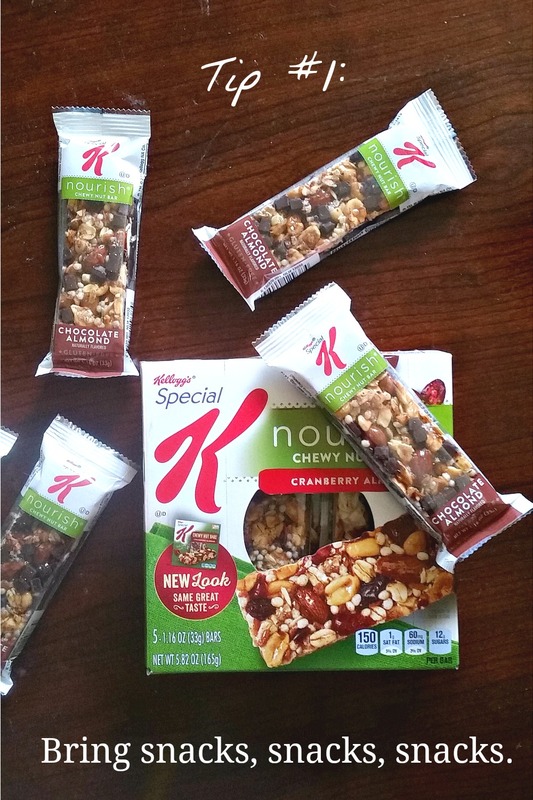 (I bought mine–Cranberry Almond and Chocolate Almond–from Target and I love their unique, progressive flavors! They also have Protein Bars that, by the way, contain a whopping 8 grams of protein.) You can find a list of other Kellogg’s travel-friendly favs here. What’s your favorite on-the-go travel tip? great tips! i like bringing a sandwich bag too for my phone in case of torrential downpours (or you know, splash mountain). omg genius. I always get owned by Splash Mountain! Thank you so much for this list! I’m going with a friend on an extended weekend trip to Ensenada on a cruise from Long Beach so this would be the perfect check list! I don’t think I can go on any trips without an external power supply. I use my phone way too much these days! Ahhhh have so much fun in Ensenada!! Good tips. Getting in touch with your financial institutions is especially important, we’ve found. Also if traveling overseas, using your AMT card is usually the cheapest way to get local currency. I agree with having easy access to important documents. If I’m traveling abroad, I’ll keep a printed itinerary with me, and I’ll make the electronic copies available in offline mode in the event that I don’t have internet. And once I get to my hotel/hostel/airbnb, I make sure to pick up a free map of the neighborhood and mark it up with where I’m staying as well as points of interest. This and google maps in offline mode usually helps me get to where I wanna go. That, and asking helpful strangers. 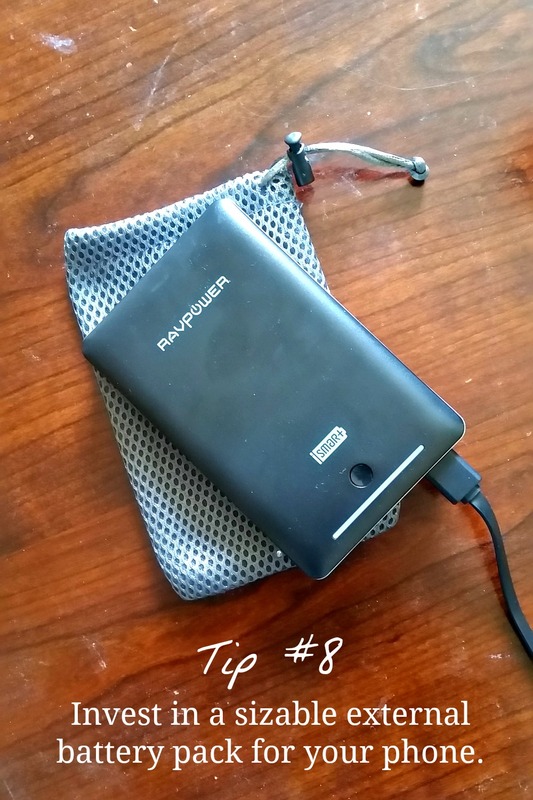 A portable charger is always on my to-pack list as well. Depending on the length of my stay, I might just opt to bring my smaller charger that’s good for about 1 full charge for my phone. As you pointed out, having the larger battery pack is invaluable when staying in a shared living space with strangers since you can keep it close to you to charge your phone when you’re sleeping. I haven’t been able to use Global Entry yet since I got it after my international travels, but TSA precheck has been great! Whenever I fly out of LAX, I always make it a point to stop by one of the lounges, even though they’re in different terminals. Having precheck means I can zip through security at one terminal, grab some free food at the lounge, and then walk to the SW terminal, zip through security, and be at my gate ready to board. I can’t wait to use GE. The collapsible bag is a must if you’re going to do a lot of shopping at your destination. I’m trying to do carry-on only travel, so I usually pack a small day bag in my travel backpack for any extras that I pick up along my travels. I’ve never thought about bringing extra ziplock baggies, but I think it’s something I will try out next time! I usually make sure to wipe dry my travel toiletry bottles at the hotel/hostel. I could probably use ziplock baggies for small miscellaneous items though, like receipts and papers for trip delay insurance claims 😛 Oh, but I do usually travel with a compression bag, so I can more tightly pack my clothes into my backpack. Communication with travel buddies is key. If you don’t meet up and talk about what you’re doing and when, it can lead to disaster. I remember some classmates of mine had a misunderstanding about lodging, and they ended up without accommodations in Nice. They stayed on the streets that night. Moral of the story? Meet up. Plan. Disagree. Come to a consensus. Travel. Enjoy. Good tip about letting your banks know about your travel plans. If you don’t get your foreign currency before leaving, I strongly suggest opening an account with a bank that either 1) doesn’t charge you for international withdrawals, or 2) reimburses you for international withdrawals. This way you don’t end up eating the withdrawal fee. Personally I would bring 2 debit cards and 2 credit cards – one of each on my person and the others in my luggage at the hotel/hostel. Also, a credit card without foreign transaction fees is a must. It’s a bonus if your debit and credit cards are chip + pin enabled. I almost couldn’t get a train ticket to the CDG airport because I couldn’t use my chip + signature card at the metro kiosk. Thankfully I was able to speak to the attendant at the counter and pay there. My go-to treat when I’m traveling is a bar of dark chocolate, because nothing is worse than trying to get to your destination, getting lost, and being hungry at the same time. The chocolate will usually hold me over until I can find somewhere to get real food 🙂 It’s something I started doing when I studied abroad, and now it’s a given. Any time I travel, I always have at least one bar with me. Man, this was a lot longer than I anticipated. A couple of quick things I’ll add is that if you’re flying a lot, it may be worth it to get a credit card that offers airport lounge access as a perk. No one likes waiting at cramped airline gates. Why not relax a bit in a lounge and enjoy some free food and drinks? For the budget-conscious traveler, I recommend looking into overnight buses between cities if possible, to save on lodging costs. Buses (and trains) are also great because you’re more likely to be dropped off in a city center compared to airlines, which tend to be further away from centers. Also, right before you pack your bag for your return journey, take a picture of all of the unused items on that trip. It’s likely that if you didn’t use them then, you won’t need them for the next trip, either. If I think of more stuff, I’ll be sure to add it.